SSG “Student-Led Study Group” nestled in the peaceful and beautiful mountains of Northern Thailand. Imagine if you will, the chance to spend 10-days in Thailand completing your Bachelor Degree and earning a TESOL Certificate as well. All this, without exposing yourself to the dangers of the world’s higher education environment. To earn a Bachelor degree and TESOL Certificate from USILACS, you must successfully complete 40 3-credit hour courses. The SSG program is a two step program. Step One: You are required to complete and pass 25 online courses with exams. Step Two: You attend the SSG facility in Phrae Thailand, where you will work with fellow students to complete the remaining 15 courses required for graduation (approximately 2-courses per day, with Saturdays and Sundays open for recreation or for the more important things). As an added bonus of the SSG program, Education III and Class Management Advanced students will be given the opportunity to work with Thai school students to refine their skills. Some of these courses are teaching internships which require you to interact and teach in local schools with local students. The SSG will provide you the opportunity to interact and learn from a group of fellow students who actually share your same beliefs, values, goals, and future plans. Yes, in just 10-days SSG attendees will complete the 15 remaining courses required for your graduation. On the final day of the SSG, there will be a formal graduation ceremony where you will be awarded your Diploma, Transcript, TESOL certificate, and a Certificate of Appreciation for your work with the local Thai School. Our SSG facility is located less than one city block from the beautiful Phoomthai Garden Hotel which will serve as your home during the 10-day SSG. Each SSG student will share a two twin bed bedroom with a fellow student. Married couples have the option of one large bed. Each morning you will be treated to a generous breakfast buffet. Non-SSG attending spouses or family members can accompany you and enjoy lodging, meals, and entertainment for only an additional $400.00 per family member. That’s right in just 10-days, in the tropical resort area of Phrae, Thailand, you will have the opportunity to complete your Bachelor Degree and earn a TESOL Certificate. You will also have the honor of becoming close friends and networking with fellow students from around the globe who share your same values, goals, and future plans. As a real extra bonus, you will also meet a lovely local group of around 32 friends who would love you to consider making Phrae, Thailand your new home. Ever considered earning your Bachelor Degree and TESOL Certificate with the help of like-minded students from around the world, while not ever exposing yourself to the worldly influence of the higher education system? Ever wondered if Thailand may be your new destination for future work? The need for skilled workers is high in Thailand. Maybe you should consider the USILACS 10-day SSG in Phrae, Thailand. Our SSG has very limited space per class so the available positions will fill extremely fast. OF SPECIAL NOTE: All SSG students will receive a TESOL Certificate; however, only by choosing the 120-Hour TESOL Certificate with Internship upgrade at enrollment, will SSG students receive a registered and numbered 120-Hour TESOL Certificate with Internship. The upgrade also provides the added privilege of spending some time refining your TESOL teaching skills with native Thai school children. While you refine your skills by working with local Thai students, we will photograph and videotape your teaching the students, and lastly, we will take a class photo of you and “your students” for your records. This actual photographic evidence of your teaching style and skills will be invaluable in obtaining employment as a teacher. You will receive photographic proof of your skills teaching local Thai students in an actual Thai classroom, local area tours, arts & crafts, local markets, as well as other exciting activities. 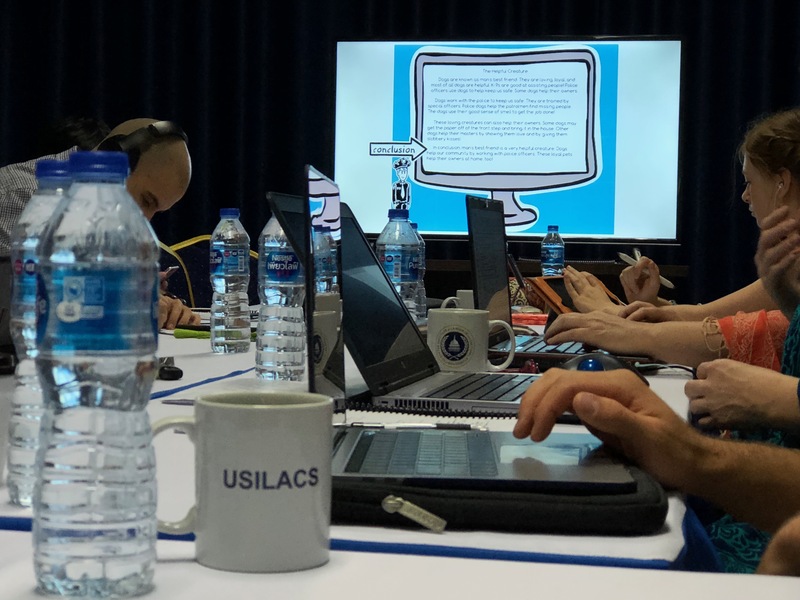 Anyone can take a TESOL class and then practice with fellow TESOL students; however, the USILACS SSG program is a once in a lifetime opportunity to not only learn TESOL but to also put your training to use in an actual classroom setting with real students. The Bachelor of Fundamentals and Methodology of Education degree program is a 120-semester credit, undergraduate program. The degree program consists of 40 courses pre-selected by USILACS. Graduates of this program will develop the skills needed to become a teacher. Teaching is a very rewarding profession and includes such specialties as in-school teaching at all levels, online teaching, tutoring, consulting, school administration, daycare, and teaching at college levels. At USILACS, we have many students who use this degree to teach English online, as well as to secure teaching licenses, Expert Certificates, and work permits/longterm visas. This degree is very similar to our Bachelor of Clerical and Moral Education. The difference being that the Bachelor of Fundamentals and Methodology of Education degree program places less focus on online teaching skills, and more focus on actual classroom teaching skills. The base courses are designed to educate you in the broad variety of liberal art subjects which are expected of an American undergraduate program. Base courses include subjects such as humanities, social science, creative arts, literature, English, math, public speaking, music, history, and religion. Building on your base courses, the Bachelor of Fundamentals and Methodology of Education degree program allows you the opportunity to develop specialized knowledge in the exciting and exacting field of teaching. You will learn valuable skills in fields such as education, classroom management, child psychology, online teaching, computer science, language, biology, morals & ethics, foreign language, counseling, and other areas needed to become skilled in the field. The Bachelor of Fundamentals and Methodology of Education degree program also focuses on education and language skills. The program includes several courses on education and language skills, as well as a TESOL certification course. All USILACS programs make extensive use of hands-on experience in many subjects. You will gain actual real-life experience in subjects such as public speaking, effective presentations, sales, morals, ethics, counseling, etiquette, and one-on-one teaching skills. Many of our courses will require you to act, give speeches, presentations, and demonstrations in front of large and small groups. Upon the completion of your performance, you will be coached, both publicly and in private, by skilled and experienced instructors. The School of Education offers you the choice of the following majors and minors for this course. The Bachelor of Clerical and Moral Education degree program is a 120-semester credit, undergraduate program. The degree program consists of 40 courses pre-selected by USILACS. Graduates of this program will develop the skills needed to become a teacher. Teaching is a very rewarding profession and includes such specialties as in-school teaching at all levels, online teaching, tutoring, consulting, school administration, daycare, and teaching at a college level. At USILACS, we have many students who use this degree to teach English online, as well as to secure teaching licenses, Expert Certificates, and work permits/longterm visas. This degree is very similar to our Bachelor of Fundamental and Methodology of Education; the difference being that the Bachelor of Clerical and Moral Education degree program places less focus on actual classroom teaching skills, and more focus on online teaching skills. Building on your base courses, the Bachelor of Clerical and Moral Education degree program allows you the opportunity to develop specialized knowledge in the exciting and exacting field of teaching. You will learn valuable skills in fields such as education, computer science, child psychology, online teaching, etiquette, language, culture, morals & ethics, foreign language, counseling, and other areas needed to become skilled in the field. The Bachelor of Clerical and Moral Education degree program also focuses on education and language skills. The program includes several courses on education and language skills, as well as a TESOL certification course. The Bachelor of TESOL Fundamentals and Methodology degree program is a 120-semester credit, undergraduate program. The degree program consists of 40 courses pre-selected by USILACS. Graduates of this program will develop the skills needed to become a certified TESOL instructor. TESOL, as we are sure you already know, stands for (Teaching English to Speakers of Other Languages) and encompasses what was once called TEFL (Teaching English as a Foreign Language) and TESL (Teaching English as a Second Language). Teaching TESOL is a very rewarding profession and is currently in very high demand around the world. At USILACS, we have many students who use this degree to teach TESOL and/or English online, as well as to secure teaching licenses, Expert Certificates, and work permits/longterm visas. Building on your base courses, the Bachelor of TESOL Fundamentals and Methodology degree program allows you the opportunity to develop specialized knowledge in the exciting field of TESOL instructing. You will learn valuable classroom skills in fields such as TESOL education, acting & drama, sales, effective presentations, psychology, online teaching, language, culture, morals & ethics, foreign language, and other areas needed to become skilled in the field. In addition to classroom and online learning, you will participate in extensive supervised and unsupervised teaching. The Bachelor of Principles and Methods Language Education degree program is a 120-semester credit, undergraduate program. The degree program consists of 40 courses pre-selected by USILACS. Graduates of this program will develop the skills needed to become a linguist and a language teacher. The study and teaching of language is a very rewarding profession and includes such specialties as TESOL instructors, foreign language teachers, international travel guides, online teaching, and many others. At USILACS we have many students who use this degree to teach language, TESOL, and English online as well as to secure teaching licenses, Expert Certificates, and work permits/longterm visas. The base courses are designed to educate you on the broad variety of liberal art subjects which are expected of an American undergraduate program. Base courses include subjects such as humanities, social science, creative arts, literature, English, math, public speaking, music, history, and religion. Building on your base courses, the Bachelor of Principles and Methods Language Education degree program allows you the opportunity to develop specialized knowledge in the exciting and exacting field of teaching. You will learn valuable skills in fields such as linguistics, phonetics, phonology, morphology, syntax of language, education, online teaching, language, communications, foreign language, and other areas needed to become skilled in the field. The Bachelor of Principles and Methods Language Education degree program also focuses on education and language skills. The program includes several courses on education and language skills, as well as a TESOL certification course.